Sad, but so true. Thanks Dems. Time for a good laugh. I think we need it after this last week. This is the first time Hillary has ever made any sense to me. If you’re on Twitter, follow A.F. Branco and you’ll get all of his great cartoons as he creates them. Interesting – and how convenient! 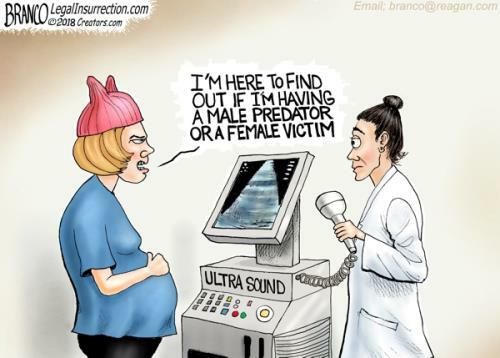 And this one would explain a lot why Ford sounded like she was pre-programmed and unable to answer questions about things that happened just a few weeks ago . . . .
It’s about time that those flinging false accusations around spend some time behind bars as payment. And that includes Swinestein! The plot thickens. Turns out Ford’s friend McLean has ties to Preet Bharara. The same Bharara who sentenced Denish D’Souza and Trump fired. And, drum roll please, fired FBI director Andrew McCabe. Must read from top to bottom. Another GREAT cartoon for Tuesday!